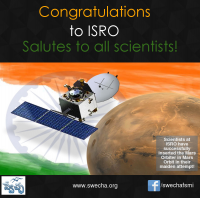 Swecha, part of Free Software Movement of India, congratulates the Indian Space Research Organization (ISRO) upon its successful Mars mission. This achievement has been possible only because of the relentless efforts of all the scientists at ISRO, who have stayed back to serve our motherland despite several lucrative opportunities abroad. Swecha salutes all such scientists. With this feat, India becomes only the fourth country in the world, next only to the USA, European Union and Russia, to have succeeded in a Mars mission! What's more laudable is the fact that ISRO has achieved this herculean task in the very first attempt itself and in a shoestring budget of approximately 450 crore rupees. This, by any standard, is no mean achievement. 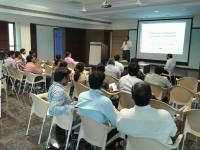 The successful completion of Mars Orbiter Mission also goes on to demonstrate the technological prowess of Indian brains, and we urge the Indian government to ensure that such indigenous technology is promoted in other spheres too, say for instance in mobile manufacturing, which has got a tremendous scope for employment generation. Times are fast changing. The employment landscape is no longer as bright as it was in the early 2000's. Several studies indicate that the demand for IT engineers has remained at 4 lakhs for the past decade or so while the number of engineers trying to get into the IT sector has zoomed over to 15 lakh.